As a family run restaurant, we place great emphasis on looking after all ages and our children’s menu features only the freshest ingredients, there are high chairs are available for the little ones, and each child receives a complimentary kids’ pack to keep them entertained. Order 3-courses for just £8.50 and we’ll donate £1 to Forth One’s Cash for Kids! 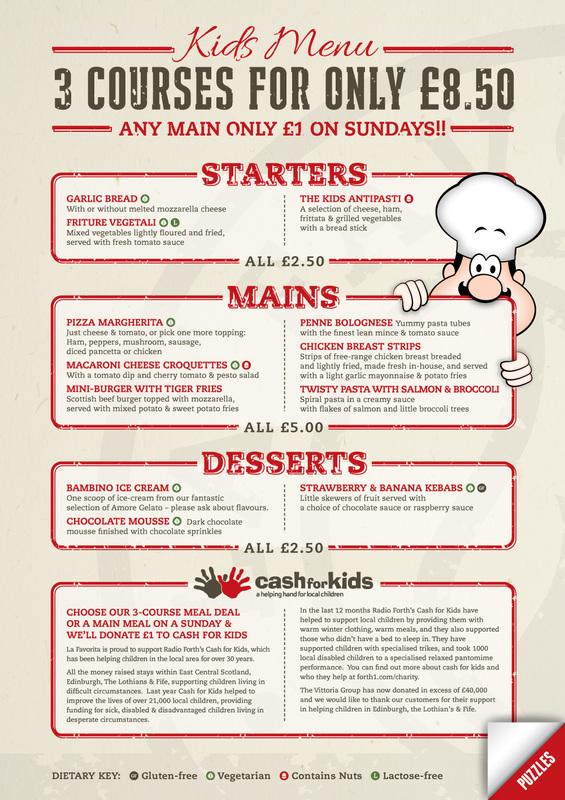 Every Sunday Kids Can choose a main meal from our menu for just £1 which we will donate to Forth 1’s Cash for Kids. Subject to Availability. Applies to 12 years and under. Not to be used in conjunction with any other offers. Can’t be used on Public Holidays. Subject to Availability. One scoop of ice-cream from our fantastic selection of Amore Gelato – please ask about flavours.